I found this wooden tiered tray recently for $2 at my favorite consignment shop, the Second Act. Do you know what these are? Glass votives I purchased for 80 cents each. 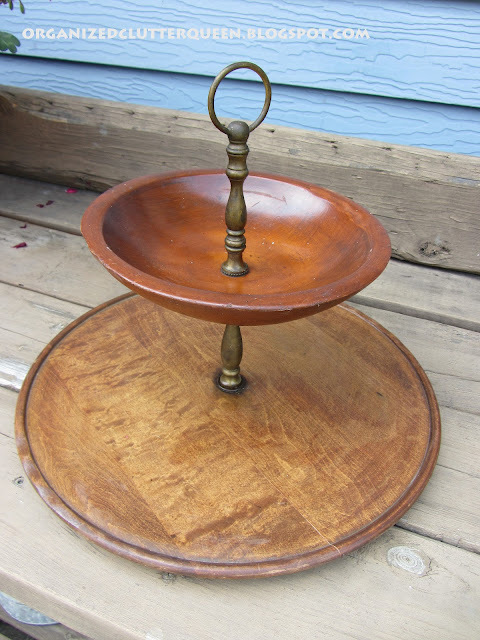 They had little rubber rings on the knobs to steady them in a candlestick base. They are now cloches. For Lefton Christmas Angels. (This is a newer angel, maybe late 1970's or early 1980's). 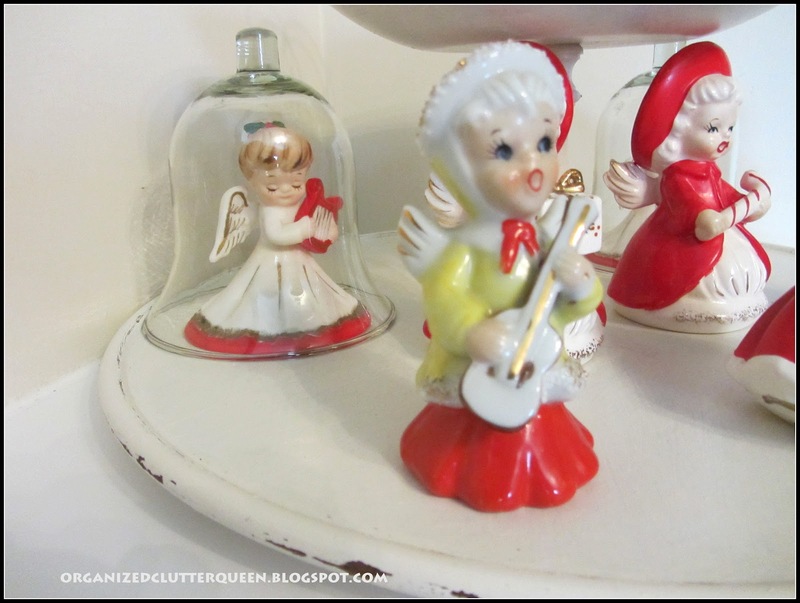 I am always looking for ways to display my growing collection of vintage Christmas angel figurines. This is just part of them, but I think this tray may work. I put some ball ornaments in the top bowl with gold beads, and the angels are displayed on the bottom. 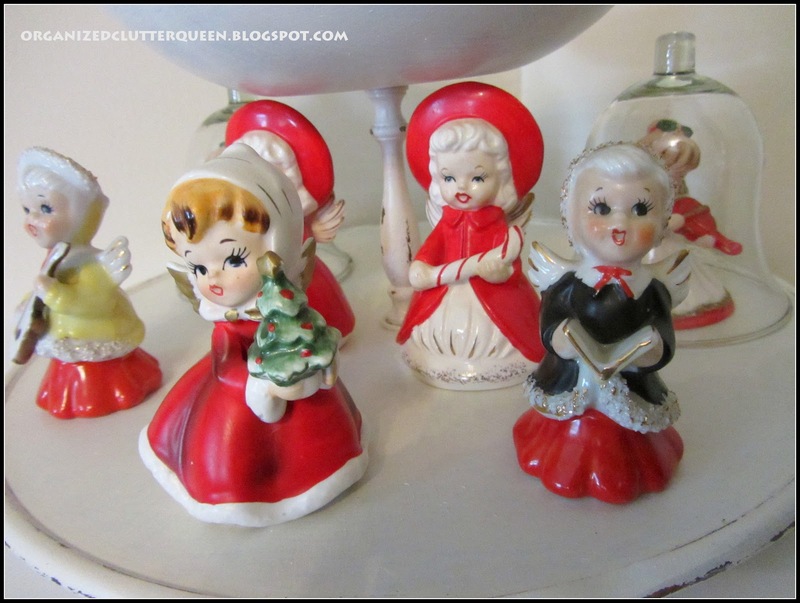 Most of these are Lefton angels from the 1960's. I love collecting my childhood. Ohhh, this is sooooo cute!!! Now you've got me getting excited for Christmas already! Lovely but I am so not ready for Christmas. Great job with the paint and the finished display. Oh, just looking at your angels make it seem a tad cooler. Lovely cloche display! Several things, Carlene! i LOVE what you did with the tray, LOVE your lefton angels and i have 2 boxes of Home interiors votive cups! 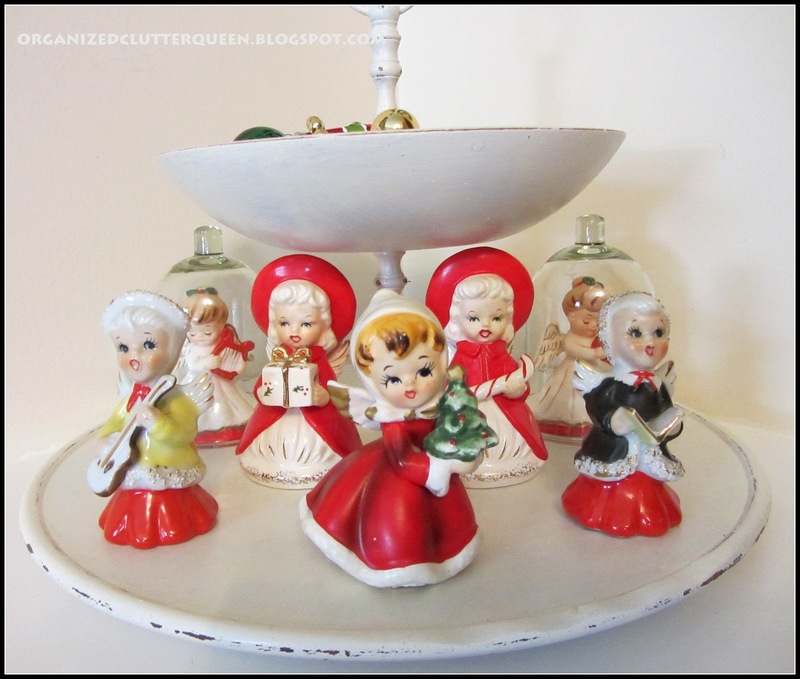 I will now be looking for small figurines that i can place under the votive cups!! Thanks so much for the inspiration! 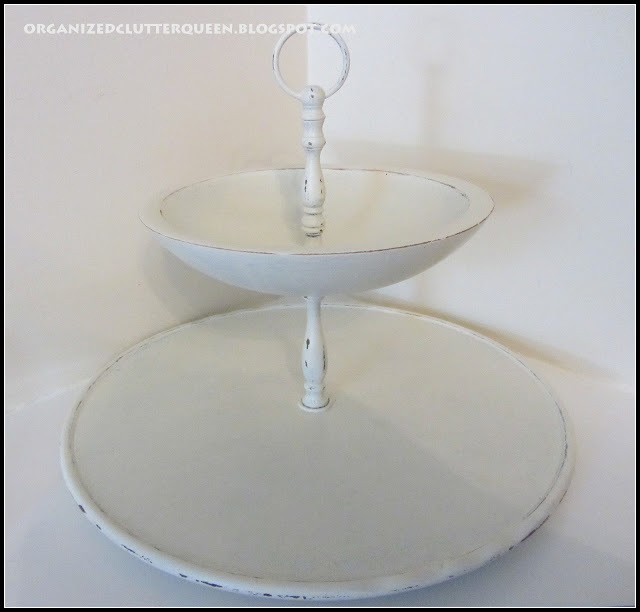 Great transformation of the tiered tray and a perfect display piece now for your angels. You angel display is adorable. I cannot believe you got that piece for $2. I love it. Thank you for linking up! Hopping over from the Christmas in July blog hop - #57. 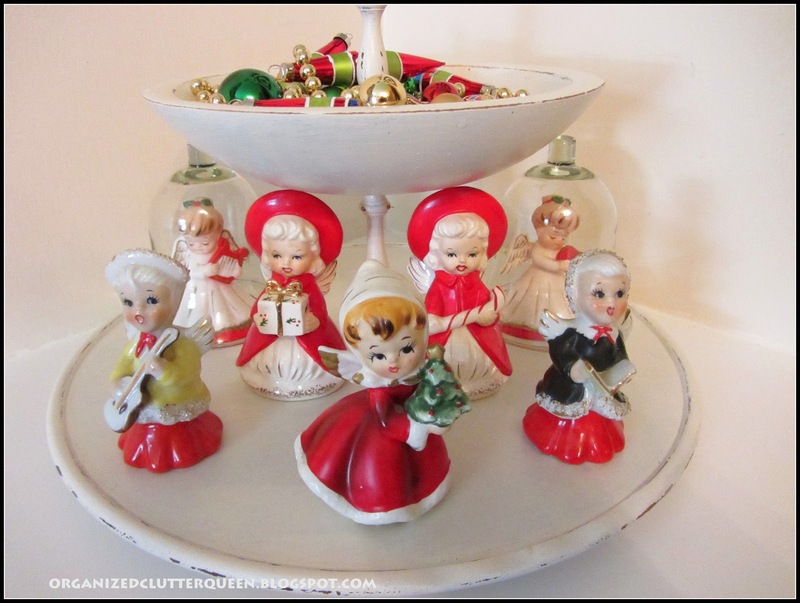 I totally love the transformation of the tiered tray and the way you have displayed your angel collection on it. Adorable! Love, love, love! Oh, I love your metamorphosis projects today! Thanks for sharing. What a great use for everything! Double cute! 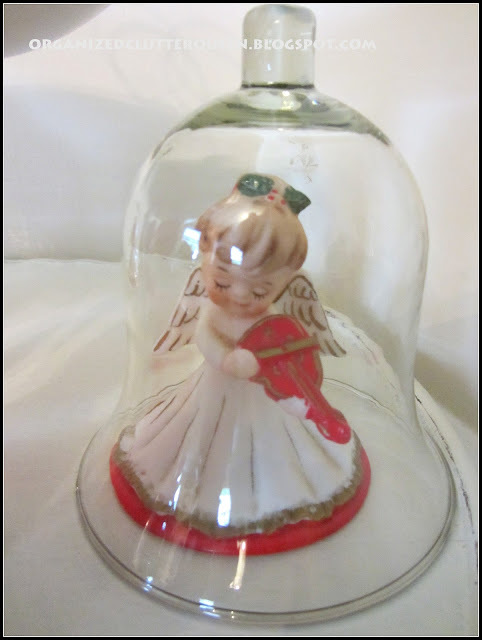 A gorgeous place to show them off, and even mini cloches! Carlene, what a darling collection. Love, love the stand painted white. 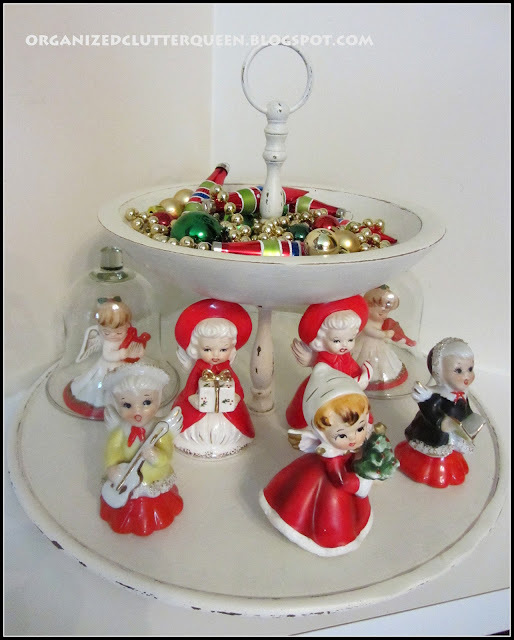 The ornaments and beads in the top bowl give it such a vintage feel. 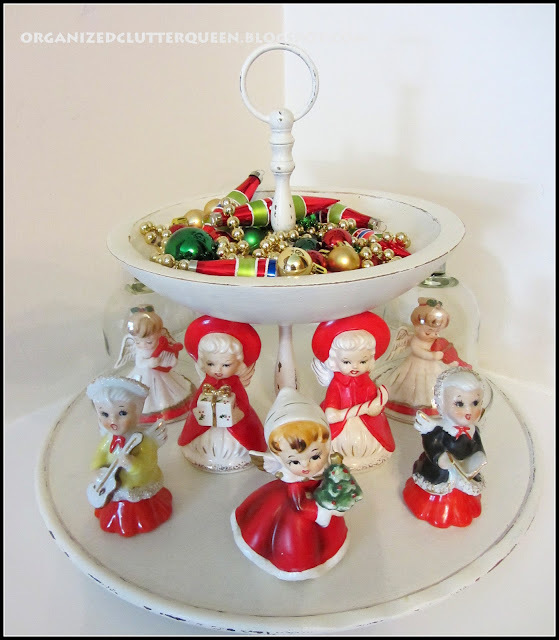 Clever idea of using the votives for cloches. Always happy to have you share with Share Your Cup. I am so happy to see these sweet little angels! I have had one of those angels ever since I can remember. I'm guessing it came from my grandmother but my mom doesn't remember. Anyway, she has always been my favorite Christmas decoration. I'm so excited to learn more about her and hopefully collect more! Thank you!!!! Lovely idea! 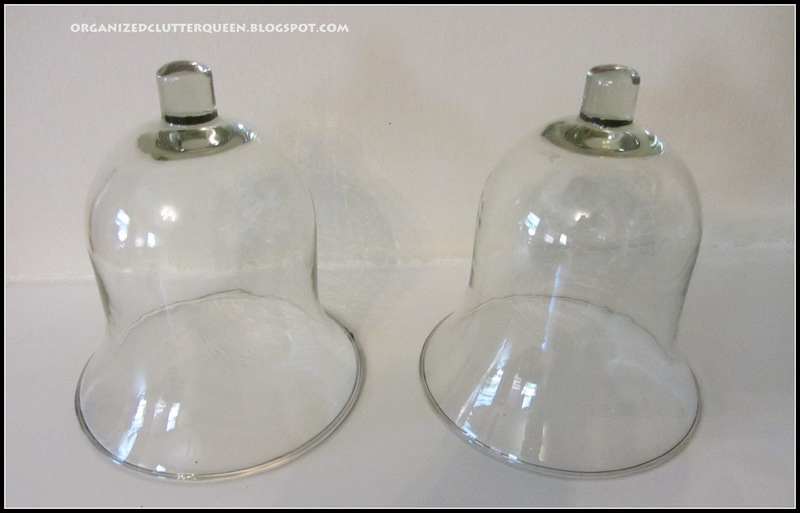 Love the cloches. Your angels are so sweet, and the display tray looks fabulous!